Staying with the odd vintage magazines, today we’ve got “Buick Magazine", from May 1957. That clock is way cool! Straight forward two page article. 1957 Buick Special, longer, lower and wider than the 1956 Buick I used to own. It‘s still a classic design. Fun article on how the design of Buick’s (and Bra’s) has changed. The Magazine is pretty serious about all kinds of crafts you can do with Leather. There is also a interesting“Occupational Therapy” angle to the whole issue. Did you know Disneyland had a “Tandy Leather Museum” in Frontierland? I may have read about this somewhere else, but I don’t know where. 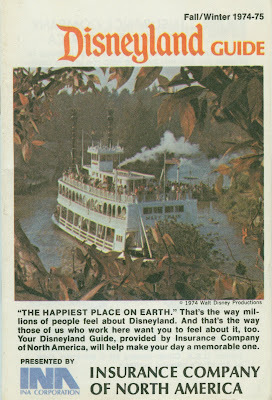 I couldn’t find much on the blogs or Google, maybe Progressland knows more about the Museum’s history and fate. A few odd things on this page. The cartoon lady – no comment. The Hooded dog, well, he has the potential to look scary, but that big smile makes him look happy. Here are both sides of the back page. Things sure were different Forty-Eight years ago. Big Thunder Mountain Railroad - Coming this Fall? Let’s pretend it's the summer of 1979. Guess what’s coming to Disneyland this Fall? Big Thunder Mountain Railroad. “A strange force has unleashed the run-away mine trains of Big Thunder Mountain, but everyday Big Thunder strikes – It could only happen at Disneyland” (YouTube Link to a great commercial). This poster was an advertisement for Big Thunder Mountain Railroad and for Disneyland’s Magic Kingdom Club members to buy tickets. 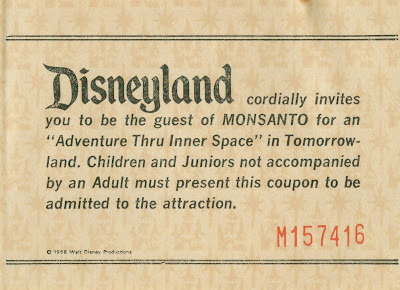 This 1979 Passport to Disneyland is a few months earlier than the above ad, but this little ticket was actually mine in 1979, I remember the day very well, I used that pass to ride Adventure Thru Inner Space at least five times and a few America Sings shows too. The Magic Kingdom Club “Magic Key Ticket Book”. 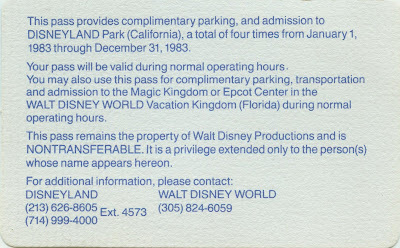 This admission ticket is actually from a 1977 ticket book, the rest of the post if from a September 1979 ticket book. The remaining five pages look like this. The back side of “Magic Key Tickets”. Classic September 1979 Attraction Lineup with the brand new “Big Thunder Mountain Railroad”. One heck of a deal for $7.50, so great that Dumbo looks happy as can be. A quick post today as I attempt to clean my blogger desk, I know there is a wood surface under there somewhere! 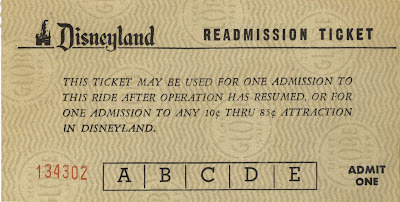 Please accept this Readmission Ticket until things get cleaned up. 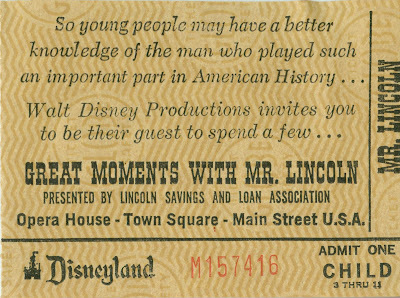 Look's like someone slipped and let the word "ride" onto this ticket, notice how it become an "attraction" by the end of the text. Welcome to Triple Bonus Sunday. There are three fun items available for your reading pleasure today. From Thursday’s post, the TView Pictorial Guide for the week of July 17, 1955. Lots of great stuff in here, wow was TV different 53 years ago. 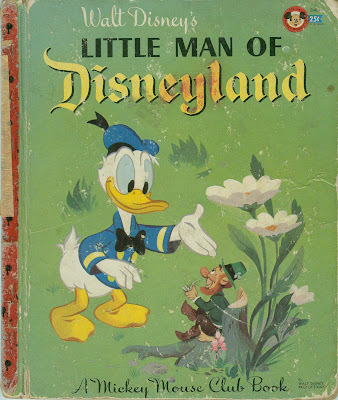 From Yesterday’s post, the wonderful book “Little Man of Disneyland” I love reading this little story. 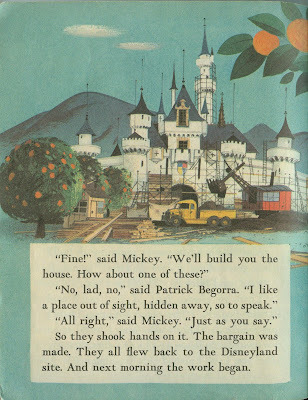 Souvenir Saturday brings us a great 1955 book “Little Man of Disneyland”. It’s not a Golden Book like “Donald Duck in Disneyland” (link) or a Whitman Book like “Donald Duck Goes to Disneyland” (link). This is a Simon and Schuster publication, part of the Mickey Mouse Club Books collection. The front cover is well used, but the page inside are still in good shape and tell one of the best little stories I’ve read in while. 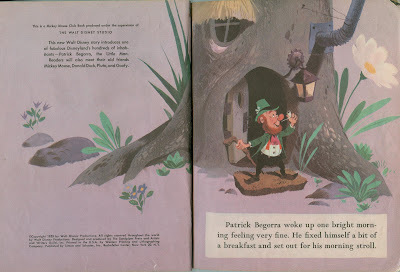 It’s all about a little leprechaun named Patrick Begorra who lives in an orange tree that is on the future site of Disneyland! My scanner is having issues so you’ll have to come back tomorrow for the entire book…. See you tomorrow for a fun packed Bonus Sunday. 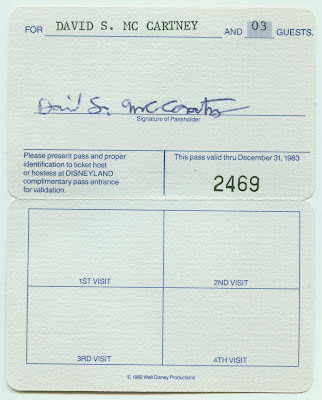 Today let’s take a look at a 1983 Admission Pass. This pass was a nice “privilege” for someone special and it’s signed (printed) by some special people, Card Walker and Ron Miller. Interesting mixing of the logos. Good for four visits with up to four people, that's a value of….? Well, math isn’t my strong point. However, it appears unused, so I guess it had no value to Mr Mc Cartney. You could also use this pass at the Magic Kingdom in Florida or EPCOT! “This pass is NONTRANSFERABLE”! While not related in anyway to the above Pass, but because this post needs some color, here is the cover to the Fall/Winter 1974-75 Disneyland Guide. This little guide has eluded my collection for some time and I just recently acquired it. It’s in great shape too; check back on Bonus Sunday for the entire guide. See you tomorrow on “Souvenir Saturday”. Today we travel back to day "one" for Disneyland or day “zero” as some may argue. The July 17th, 1955 issue of “Pictorial TView” a section of the New York Journal American, which I guess was (is?) a local New York City newspaper. This is a LARGE format TV Guide that I suppose came with the newspaper. It measures about 10” by 16” per page, 20 pages total. Dennis James is on the cover, I didn’t recognize him until looking at other photos of him on Wikipedia (link) you’ll probably remember him too. He’s was in Television since 1938, wow! A truly fascinating article by Jack O’Brian quoting Leland Hayward about “Tollevision” or “Subscription TV”. That’s a pretty far out concept for 1955. Some of his statistics and dollar amounts seem out of line, but check out his future prediction about TV sets: “by the time fee-TV happens along, the old TV tube will have been replaced by TV screens hanging on walls in about four by five feet dimensions” I say he got half that prediction dead on! “Television’s Greatest Spectacle”. The ad claims “You’ll travel on the world’s largest miniature railroad to Adventureland”. Was the train ever supposed to stop in Adventureland, and if so, where??? Brought to you by - American Motors, Gibson Greeting Cards and Swift & Company. Next is a page from the center of the guide, the “Cheering Section”. Oh boy is there some dry humor in here, if you want to call it humor. Check out the big cartoon by Michael Berry, those ladies are, well, they remind me of a 1955 Cadillac front bumper…. Michael Berry did art work for Esquire, Liberty, The New Yorker, and many others, check out some of his work here (link). Speaking of 1955 Cadillac’s, I’d fill mine up with Sunco’s new advanced Blue Sunco “Premium quality high-test gasoline that sells at the regular price” which was about 29¢ a gallon in 1955! Come back on Bonus Sunday for the entire 20 page TView pictorial guide in high-res PDF format. 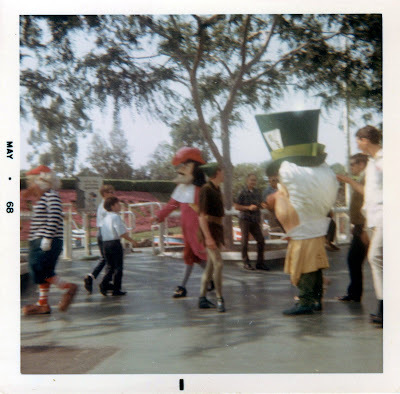 Traveling back 40 years we find ourselves in Disneyland of 1968. No more Walt Disney signature on the welcome note, I think they should have left it on there. 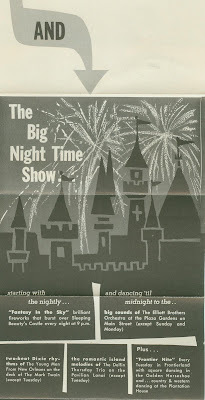 This is an October 1968 Ticket book and it’s for “Magic Kingdom Club” members. In the off season these special ticket books were not only discounted (as was standard for “Club” members) but they were full of “Magic Key Coupons” all good on any attraction! What an amazing attraction line up. Where to use the 10 tickets? I would use at least 4 tickets for the PeopleMover, my ride on the Florida version has me desperately wanting a PeopleMover back in Anaheim. The “Magic Key Coupon” good on any attraction, they look magical don’t they? Ladies and Gentlemen, the “back side” of a Magic Key Coupon. Also included in this ticket book were two bonus tickets. Mr. Lincoln and Adventure Thru Inner Space, that technically makes this a 12 adventure ticket book! And now for a few snap shots from May 1968. These appear to be “instamatic” type prints on 3” square paper. They aren’t very clear, but still fun. The Mad-Hatter with some sort of musical group behind him. Oh, I see some neat classic Disneyland balloons back on the right! That’s got to be Happy! Hey, Story Book Land is closed today???? Check out the elderly couple holding hands, how cute. What's with the poor patch work on the slurry? 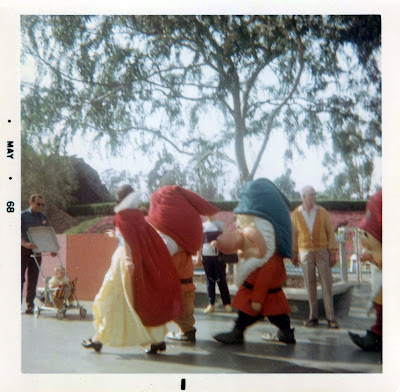 Some of the other dwarfs and the “back side” of Snow White. Looks like there’s a construction wall for part of Story Book Land, oh, and a Stroller for Daveland. 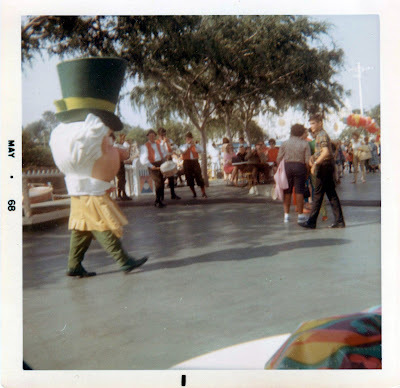 A blurry Captain Hook, Peter Pan, Mr. Smead and the Mad-Hatter again, he looks bored! 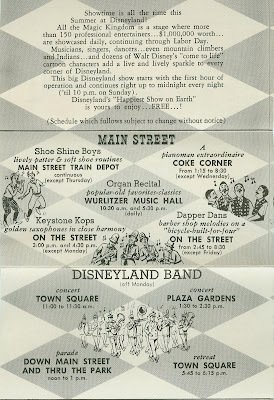 Disneyland's "Happiest Show On Earth"
Today’s post is a neat little flyer/brochure/fold-up thing. At about the size of a business card when folded, this 8 panel flyer is chalk full of information. 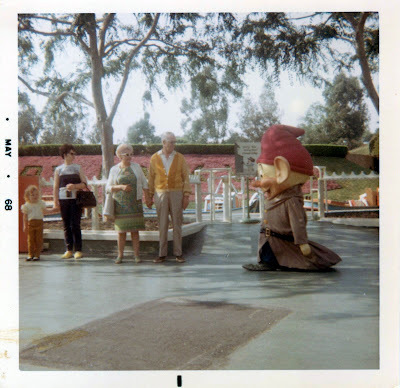 It’s not dated, I would place it around 1963, but Progressland can tell us for certain. Although this part looks like a ticket, its not, since all this amazing entertainment is included with your admission to the park. One Million dollars worth of entertainment, wow! A pretty amazing line up. I love the art work! 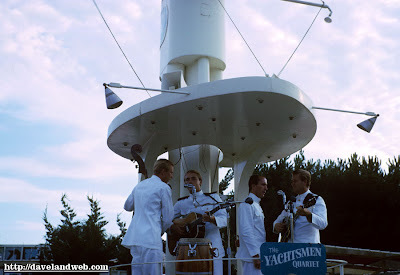 Since the Yachtsmen are playing in Tomorrowland and this post needs some color, here is a great photo from 1965. Thanks Dave! (Daveland Blog link). And there’s a Big Night Time Show too! “Frontierland Nite” square dancing every Tuesday. "Allemande Left with your left hand. - Back to the partner for a Right and Left Grand – now Promenade". And “Don’t Forget Date Nite”. 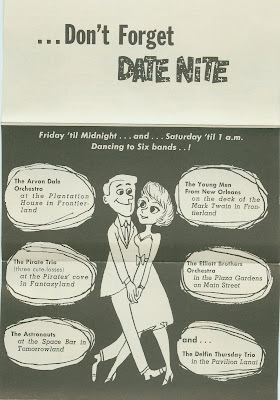 On a previous post (link) you can see a Date Nite Ticket book and ticket.